Have we finally breached the symbolic ‘real media’ vs social media divide? There's an interesting post over at the Journalism.co.uk blog where they are trying to crowd source the perfect press release. The post offers some great press release-writing tips for people new to the industry and even acts as a reminder to those more seasoned PR professionals about what journalists really want to know about a story. But what's interesting about the results is the inclusion of social mediia elements which are being specifically requested by journalists. Maybe I'm wrong to be surprised, but when journalists are asking for "a headline have crossed over into … short enough for a Twitter update including a link." then it seems we really have gotten over the online vs offline; 'real media' vs social media divide. The only thing is…. while journalists are adapting quickly to a new, more real-time media environment have PR professionals? I still see a lot of "no-one really reads blogs" or "Yes, but what's the reach of that Tweet?" from PROs. So here's the real incentive: even if you want to ignore that the media landscape and infrastructure is changing around you….. the journalists you are pitching stories to already get it and if you don't adapt accordingly then you'll be less effective at doing your job. Simples! Book launch from David Brain on Vimeo. 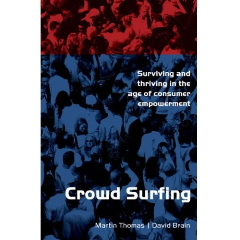 David brain has kindly made the video available of the recent book launch for Crowd Surfing. Enjoy. Edelman’s European CEO and author, David Brain, kindly invited me along to the launch of his new book this week at the Groucho Club. 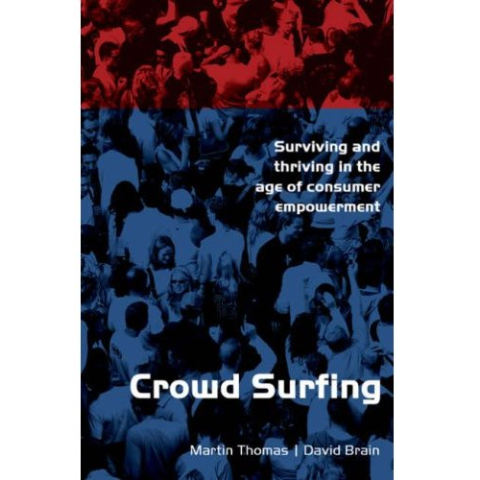 Crowd Surfing, co-written with Martin Thomas, is about how changes in society – and more specifically consumer empowerment – are changing the commercial and political landscape (Regular readers of this blog will know that these are two themes right up my street). One barrier I think any author writing about this topic will encounter is how to adequately summarise and crystallise ideas or examples that have become almost cliches or accepted logic in business – and particularly marketing -circles. Everyone seems to ‘get’ Web Two Point Oh and want a digital empowerment strategy as standard. But in the rush to ‘tick the boxes’ (as I heard one client remark recently) there is the real risk to entirely misunderstand what changes are *really* happening and why. I haven’t yet finished my copy of the book but so far and Crowd Surfing hasn’t disappointed. The authors give a clear outline of what the phenomenon of ‘customer empowerment’ looks like and why is matters. Subsequent chapters look like they will provide clear case studies illustrating real life examples of where companies have got it right and wrong. I see that the 2012 logo launch makes its way to the pages; a case study with which I may be a little too familiar! James Cherkoff has read the book and already posted his review. It was also great to catch up with Antony Mayfield, Stephen Davies, Stuart Bruce and Justin Kerr-Stevens again. And also to meet Amelia Torode and Dom Campbell for the first time. Our esteemed European CEO and fellow Edel-blogger, David Brain, will be officially launching his new book, Crowdsurfing, next month. In hot anticipation he has produced a short video about the book with his co-author, Martin Thomas. Crowdsurfing from David Brain on Vimeo. If you like what you see you can buy a copy from Amazon.